Why would you make something that you could just run out and buy? Lots of reasons. Homemade food tastes better. Natural cleaners are safer and cheaper. And making stuff with your kids is just plain fun! I’ve been “making instead of buying” for a while. Some of my attempts work and some don’t. With the exception of a few flops, we’ve had good eats and made great memories. Here are some tried-and-true recipes that we use all the time in the BrownThumb household. Don’t be afraid! These are easy—if you can make cookies, you can make these. No MSG, no fillers, and you can make a huge batch for very little money. Get your spices from the ethnic food aisle for maximum savings. A giant pan of these barely lasts a week around here. We would go broke if we bought that many of the prepackaged bars, and Jackjack and I have fun making these together. I mix up the rice, pasta, and spices ahead of time and keep it in the pantry. Just measure out one cup of dry mix and two cups of chicken stock and you’re ready to go. This can even blurble along in the rice cooker while you make the rest of dinner. The ability to manufacture chocolatey goodness needs no explanation. 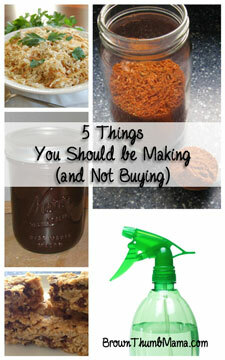 Read 5 MORE Things You Should Make (Not Buy). Love this round-up! We make granola instead of buying cereal. I feel so much better about feeding it to my family when I know exactly what’s in it. I stopped buying bottled salad dressing and started making my own this year. A million times better! Could I ask for recipes please for dressings. I make all of the above, except the rice-a-roni! (Which will be next on my list!) Thanks for posting practical tips for busy moms! As a mom of 3yr old twins, practicality and health is a must! What I decided to stop buying is chili spice mixes. Coffee gets brewed with cinnamon, cloves and a pinch of ginger. I can buy it plain but have that extra pop of flavor in the travel mug sans grit. Apple Cider Vinegar & Baking soda in place of shampoos and conditioners. I use cloth pads but can’t convince my teen to go that natural. Not microwaving led to popping pop corn on the stove. It gets sea salt and pepper. YUM! Speaking of salt we have used ordinary table salt in place of laundry detergent. I like it better than trying any of the more complex homemade mixtures. salt instead of laundry detergent?? It really works? Seriously.. COMPLEX HOMEMADE MIXTURES?? Ok how complex is mixing say 3 cups each baking soda, super washing soda and borax.. and 1 grated (like with a cheese grater) bar of Felsnaptha (or even ivory) soap, then put into a container and shake it to mix it up??? My 1 gallon sized jug lasts me months using 1/4 cup per load. And you don’t even have to use all 3 of the powders. Remove the Borax and just use the sodas.. or just use 1 soda and borax. Or heck just use either of the soda by themselves. I use a 1/4 cup of peroxide in the rince cycle for my whites instead of bleach. Why pads and not a cup? This is great. 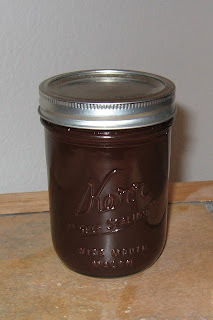 I believe that we’ll be making some homemade chocolate syrup this weekend. We like our chocolate milk since it’s a great recovery drink for post athletic endeavors, plus it tastes pretty good too!! I make my own facials out of honey and an aspirin. It works wonders on pimples! How do you do that? I have teen boys and we tried a few things. So far tea Tree oil works best, just not 100% with pimples and blackheads. Please share TIA! What about your own laundry soap?? We’ve been making that for two years now and it’s AMAZING and so easy to make!!! Thanks, Mandy! I have made my own laundry soap, but recently took advantage of the $10 Vitacost credit and got a free bottle of JR Watkins. Can’t beat free! I can make chocolate syrup?! Bless you. You can also make your own deodorant and avoid the aluminum. I make my own moisturizers, lip gloss, shampoo, laundry soap, etc. It’s amazing how the budget stretches when you stop buying stuff you can make yourself. I made my own deodorant but I think the oil stained my clothes. What’s in your recipe? This one is great! Not oily at all. Hi Brown Thumb Momma! I love your site! I make a lot of things myself, too! One of my favorites is this homemade deodorant recipe: http://myhealthygreenfamily.com/blog/wordpress/home-made-all-natural-deodorant-with-men-and-womens-fragrances/. There are many other recipes on the web as well; this one works for me. Blessings from Bama! I make convenience things as well to save money and to know what is in the things. Muffin Mix, Pancake Mix, taco seasoning, herbs de provence, za’atar, Italian Seasoning, chocolate syrup, and more. I make my own mayo (safflower oil instead of the soy oil used in commercial brands) flaxseed English muffins, whole wheat and spelt bread, salad adressings, dried tomato tapenade, ricotta cheese, mozzarella cheese…….. and pizza every Saturday night! great stuff here always looking for a different way of doing things! Hi, this is my first visit here, great blog/site! OK, I take care of elderly people, in a house, a small Assisted Living Facility in FL. They’re incontinent, mostly, so the laundry can be a smelly process. (urine, they do wear pullups but sometimes leak around the legs) But I would love to make it both more cost effective and more Healthy for them…. Suggestions? I use vinegar with all my laundry, instead of fabric softener. It works miracles on that kind of smell and helps the close to rinse cleanly as well. So do you put the vinegar in the drawer where the conditioner goes? How much per washload? A cup of baking soda added to the load with the detergent (I use homemade) works wonders on our potty training accidents. I live so many miles out of town and it’s faster and easier to make certain things myself but I love your choices (I haven’t made them). This just sucked me in from The Crafty Blog Stalker Blog Hop. I would love for you to share this or any of your great posts at Freedom Fridays. So hoping to see you there. Great post! I need to make more homemade granola bars (I keep giving in to convenience). I love the tightwad gazette by the way, super handy! Those are great choices for things to make yourself instead of buying. I should try to start doing that more often with things I use often. Such good tips, I’m defintely going to have to try some of these! I get the same questions from my husband…until he sees how much money we’re saving. I make my own bread, yogurt, cocoa mix, etc. I actually enjoy it, and I like knowing what my family is eating. I can’t wait to try your recipe for chocolate syrup! 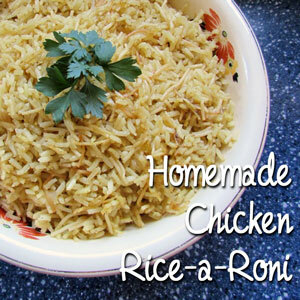 I never buy rice-a-roni but always wish my rice had more zing – here’s the solution! I do make the rest though, I will never go back on the taco seasoning, so delish. Do you have a co-op or health food store nearby? I get my spices there, and they are CHEAP. Technically buying in bulk but you can buy just an ounce or two. Also much better quality than the groc store. Taco seasoning, ranch dressing, french dressing, ketchup, bbq sauce, strawberry jam, raspberry jam, pizza dough, teriaki sauce and more! Great list, I will be making the chocolate syrup tomorrow! Challenging! I want to make my own deodorant. Do you have a recipe that works? I make a lot of those things too! I have bought very few cleaners in the past 12 years. I try to make my own any chance I can come up with a good recipe. Good post. thank you for sharing at Thrifty Things Friday. Have a wonderful day! Love love love http://www.everydayfoodstorage.net, she has lots of make it yourself stuff too. Thanks for these as well!awesome! My husband is the opposite, he always says, I’ll bet we could make this! Homemade yogurt is SOOOOOOO much more delicious than store bought. Also, I don’t buy cans of beans and things, I put a large batch in the crockpot and then freeze in small serving containers. Garbanzo beans come out perfectly soft and delicious and that’s not always the case with the canned variety. My husband is the same as yours. He just asked me yesterday why I spent all day canning pickles. I ran down the same list you gave, plus, I like canning! Do you put the chicken bullion in the rice-a-roni when you mix it up to store? Or do you leave that out since you are using the chicken stock to cook it with it? I use homemade stock, so I haven’t tried storing it with the other dry ingredients. I bet it would work, though! I definitely love making our own cheese, breads and cakes!! Making your own stuff has always been a favorite in my family. The times with all of the grandparents and other extended family member are memories well cherished. Canning in the fall was always the best of times. Nice list! One thing we make ourselves that I’m surprised so many people buy is shredded cheese. We buy a 2-pound block of cheese, cut off about 1/2 pound to be eaten in chunks or slices, then grate the rest all at once and freeze in 2-cup bags. This way we only have to clean the grater or food processor once, and we have handy shredded cheese to thaw when we plan to make burritos or something. Unlike cheese frozen in a block, it doesn’t change texture. We think it tastes a lot better than store-bought shredded cheese, which usually is coated with something. Some other things we make are spaghetti sauce, electrolyte replenisher, this facial scrub and/or bathtub cleanser, and soft spreadable butter. We also found an easy way to make baby food. Yes! I make a lot, and there’s some flops in there which my kids like to remind me about. I’m almost forbidden to make ketchup ever again. Love this post — all great DIY’s. So glad you shared with us at Rural Thursdays! Do you toast the rice a roni mix at all? Do you think it would work if I toasted it ahead of tome? You can toast it when you cook it–that works best. With a little butter…mmm! I definitely need to try the chocolate syrup recipe. My kids are always asking for some, so it would be handy to just be able to make some! 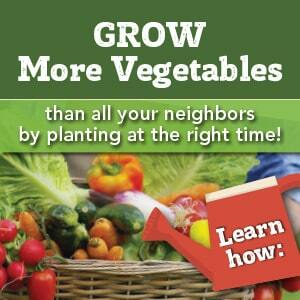 Thanks for linking up with Eat Make Grow! Hi! This was a really great list and my readers thought so too! You will be featured at this Fridays’s Small Footprint Friday Link-Up. I really hope you will join us again with your green living posts! You go girl! I would love to have you share this on The HomeAcre Hop! Fabulous, this fits really well with my determination to spend less in 2013. Found you on the HomeAcre Hope – thanks for sharing such great ideas. I make a bunch of stuff from scratch, no mixes around here, and I do all my spice mixes myself too. There are a ton of ideas online.Thanks for sharing this on The HomeAcre Hop! So glad to have you join me 🙂 Can’t wait to see what you have to share next week! Our youngest is a “Ketchup snob.” I FINALY found and tweeked a ketchup recipe that he hasn’t figured out is home made yet. Of course it may help that we put it in a Heinz bottle. I make a lot of things homemade. I want to start making my own condiments, mayo, ketchup, etc. I make taco sauce and cleaning products. Thanks for the list. I’ve been making the taco seasoning and glass cleaner on my own and have tried granola bars a couple of times. I’ve been using vinegar & water for the glass. Going to add the alcohol as well. I assume that helps with streaks? Great ideas! We make peanut butter, ghee (wayyy cheaper than store-bought), granola bars, and I prepackage spruced up oatmeal instead of buying a box of those little packets. We make a lot of stuff from scratch. I’d much rather have the individual ingredients at home to make things up than buy the stuff at the store. Over the years I have made a lot of stuff instead of buying from bread to bread crumbs, mostly in the food department. We don’t buy napkins as I made them years ago and once in awhile make another batch when they wear out. Thanks for this post as it is a good reminder to save money. I linked right after you on The Alabaster Jar. I am working on making more things from scratch. I have been making bread, bread crumbs, chicken broth, enchilada sauce, and pizza dough the longest. I try to add a few new things to my list like biscuit mix and homemade Shake n Bake. I have also started keeping ball jars with the mixes for corn bread and scones in the cupboard so that they are super easy to grab and make quickly (like a box mix). I am still working on getting the perfect recipe for some of my not so perfect recipes like taco seasoning… not a total flop because I use it in my sloppy joes 🙂 I am going to have to check out your recipes and see what I can add to the list!!! I really like your ideas……Thank you for sharing with the Clever Chicks Blog Hop this week; I hope you’ll join us again! 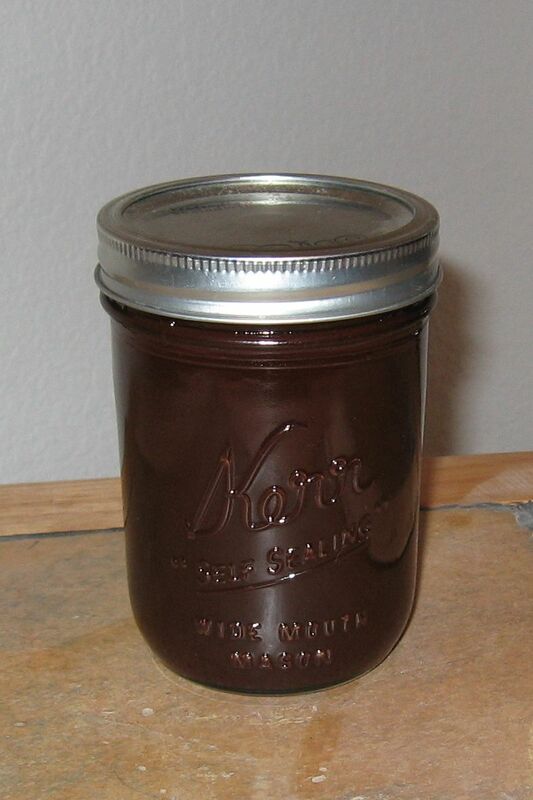 Oh, I like the sound of homemade chocolate syrup! Also have been wanting to make our own granola bars… on my way to check out your recipes! We make our own ranch seasoning (for dressing and dip), taco seasoning, and fresh salsa (we don’t buy anything pre-packaged). We also make our own baking soda shampoo, “conditioner”, glass cleaner, bathroom cleaner, laundry detergent and stain remover. I like the idea of making homemade granola. We used to do that a LONG time ago. We make homemade granola, yogurt, tortillas,bread, face wash, laundry detergent, deodorant, tooth powder. Making at home is so much more cost effective and healthier! 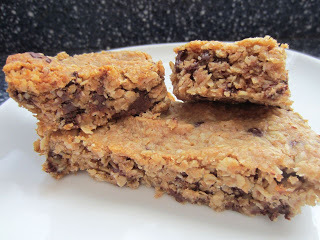 I can’t wait to try making those granola bars- they look so good! That would be a great snack for hubby to take to work. We also love making our own “stuff”. We do taco seasoning, laundry detergent, fabric softener, etc, etc. Making from scratch is so much healthier and frugal. Congrats on being featured on Wildcrafting WEdnesday! I’m sharing this on Facebook, Twitter and Pinterest! I wouldn’t have thought of doing the chocolate syrup. Thanks for sharing these on Tuesday Greens! I couldn’t agree wit you more:-) 🙂 we make ricotta, tortillas, hummus, sometimes nut butter, chicken stock, granola bars, tomato soup, cream soup, and thinking about pasta and yogurt! Homemade is so much better! I just usually throw some spices in my hamburger meat for tacos, but a recipe and a jar full of it? I’m in! I make a lot of from scratch items like breads, jams, pancake syrup, cleaners, decorations, sewn items, etc….Yay for homemade!!! I make my own Stove Top Stuffing Mix. I use an empty large spice container to store my pre-mix of spices. I use these spices for Rice-a-Roni or stuffing Mix.. It all started when I made a Garlic Pull Apart Bread; the bread was great when hot, but awful once cooled. I cubed it up, and dried it on a cookie sheet in my oven (no need to heat, just wait a few days). Now I cube all breads that hang around more than a day or so. Just be sure to cube them small (1/2″). I’ve been making my own Taco Seasoning for years. 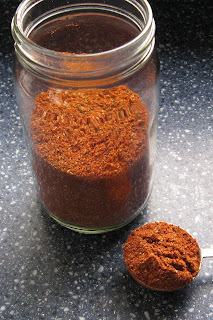 Another I make, and it may be mentioned already, but I make my own Pumpkin Pie Spice! There are lots of recipes on-line. I cant get to the Rice-a-Roni recipe and seasonings. I would love to try this. Does anyone know where to get it?